When it comes to style, Harlem is definitely the place to go to see fashion forward people who don’t let the mainstream and norm define who they are, or how they dress. If anyone knows this, it’s the innovative proprietor of Harlem’s bespoke hat shop FlameKeepers, Marc Williams, who came to Harlem two years ago with that insight in mind. 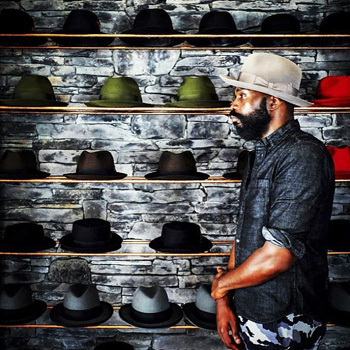 A hat lover, Marc decided to open his shop in lower Harlem, after spending years working downtown. What he found living and hanging out in in Harlem was that the the energy in the streets infused every part of life and style — thus Flamekeepers was born. It allowed him to ‘keep the flame’ alive of style and swagger he loved so much about the place he called home. Flamekeepers blazes new trails in style with its broad array of hats in rich, bold colors — and in styles you don’t normally find in run-of-the-mill hat shops. True to its neighborhood, it has that Harlem flair with everything from fedoras to top hats and caps. With Fall right around the corner, it’s the perfect time to stop in and spice up your wardrobe with their latest offerings. I like to think that if Miles Davis was alive, this is the place he would shop.